The second “small batch” run of the new Piezography Pro inks are now available, and with it the new Piezography Ultra HD Matte Black is available for individual sale to use with existing K6 and K7 ink sets. The sales and social media posts about the new ink was reported to have a Dmax of about 1.8, which is incredible for unpolarized measurements from matte inkjet prints, but there haven’t been any outside tests or reviews of the new ink (as far as I have searched). I was eager to load it up and make a few tests myself and compare it to some of the existing matte black inks out there (I haven’t tested HP or Canon inks with QTR yet so these tests were limited to most common QTR compatible inks). I also should first note that around the time the PiezoPro inks were coming out I created my own custom K5+LcLmY set for specialized toning setups. I invested a lot of time and energy building different toning profiles and it didn’t make sense to switch the printer used in these tests over to the dual quad PiezoPro inkset. I am planning on installing that in a partially clogged 9900 when I get around to swapping out the capping station and damper assembly—that is a whole other situation…. Back to the 3880. Before switching the Shade 1 MK cartridge in my current setup I did a quick test comparing several other existing carbon matte black inks to the new Piezography Pro Ultra HD Matte Black. You can read about some testing I did a few years ago with the existing Piezography Shade 1 Matte Black and Eboni Matte Black (version 1) in this post Comparing Cone Piezography Shade 1 and MIS Ebony Shade 1. This time around I set out to test the Original Epson UltraChome MK from the x800-x880, the new HD Matte Black in the P800 (and all the other new Sure Color series printers), and the STS MK I have been using in the small format 1430 I use for other kinds of testing (the STS MK didn’t make it into the 3880). How you actually swap out the cartridges and inks will depend somewhat on your printer model. The small format printers like the 1430 or 2880 that do not have ink lines will only require swapping out the refillable MK cartridge and a quick head cleaning procedure and nozzle check to make sure the ink is flowing properly. As soon as I got the old Epson MK cleared from the lines I wanted to do a quick relinearization of some existing curves I had for the K5 inkset just to see what impact the new black had on a quick test print. The shadows and deep blacks in the print were denser, but the relinearization wasn’t as smooth as I would like (as in it wasn’t perfect) and I wanted to see what this ink could really do with my QuadToneProfiler tools. The other benefit of starting from scratch is that you can see exactly where the sweet spot in the ink limit and carefully define how evenly each of the diluted inks are distributed throughout the scale. It is a welcome surprise to see this new ink does not have the same “oily” reflectance the STS MK has, and does not get lighter when the maximum ink load passes its optimal level. This is a distinct difference from the STS MK which results in lower reflected densities as the ink limit increases, and, even when there is no measurable tonal reversal you will still often see a noticeable shift when the STS MK hits the 100% step. The nice thing is new Piezography Ultra HD MK continues to increase in density all the way to 95%-100% (although there might be little to actually be gained when setting the limit that high due to excessive bleed from such a high ink limit and the increased overlap of the Shade 2 ink. I actually did test this and I found that an overall K ink limit of 55 and a K Boost setting of 75-80 was producing a Dmax of 1.77-1.78, and there was no difference after manually setting the Dmax quad value in the black channel to 95%). The tests were pretty simple in that they were just measurements of a 21-step grayscale using the K channel from each ink separation image. I used an average of four samples per patch for each ink. These prints were force-air dried for two minutes where I took and initial measurement, and the left to air dry for 24-36 hours before taking the final measurements used in the graphs. I usedHahnemühle Museum Etching to make these tests. There is a slight tooth to this paper, which in some cases could a result from increased random scattering of the light and densities appearing lower they actually are. A quick test of the UHDMK on Hahnemühle Photo Rag resulted in similar densities to the Museum Etching so I didn’t want to take the extra time to test multiple papers from the same manufacturer for this first round. 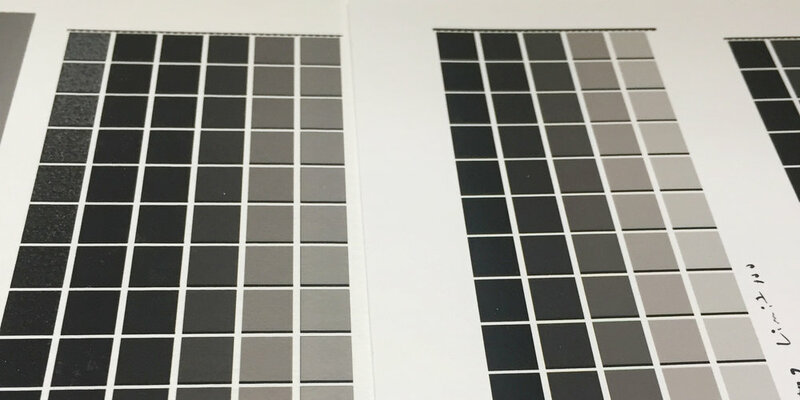 The new Piezography Ultra HD Matte Black is clearly the densest, closely followed by the new Epson MK used in the new Sure Color series printers. There is no current solution for using third party inks in the new Sure Color printers so those making prints with the UC K3 inks will be satisfied with the advance in the Epson Inks as far as Dmax goes. However, if you are able to use third party inks in refillable cartridges, there is no reason to use any other ink than the new Piezography UHDMK. Looking at measurements from an ink separation image can be insightful, but the Dmax from the overlapping shades will usually not match what you set in the ink limit for the K channel. This is usually because of the additional overlap from the next lighter shade at the very end of the scale, and there needs to be a careful balance of getting the highest possible density while preventing excessive bleed, and a slightly lower density from overlap of the diluted gray inks. In the two Hahnemühle papers I tested I was able to maintain a Dmax of 1.77-1.78 (L* ~13.7) 1.81 (L* ~12.92) where all the other inks were the best to around a Dmax of about 1.65 (L* ~16.7). The best I was ever able to do with the STS MK was with Museo Portfolio Rag that maxed out at1.7 (L* ~15.45). If you do switch inks there are a few options you have for linearizing and profile making, and which one you choose will depend on how far you want to dive into the process, how much money you are willing to spend on it, and if you have the ability to measure your own printed targets. QTR-Linearize-Quad($50 and included with the QTR license): If you do have the ability to measure your own targets you could use the built-in QTR-Linearize-Quad applet and a 21-step measurement file to get a decent general linearization without spending any additional money. This might be the least-best option because 21-steps are usually not enough to get the right amount of separation in the higher and lower densities from existing quad curves. My QuadLin Service ($45): If you do not have the ability to measure your own printed target I offer an affordable service that will relinearize your existing curves. You print the standard 51-step target to me and I will make a linear and modified gamma-adjusted set of curves. I use my own error correction and linearization methods that produce prints that are indistinguishable from the Piezography methods (please note that will not make custom curves from the Piezography master curves). My exclusive QuadToneProfiler Deluxe Edition, Pro, and QuadLin curve creation tools ($50-$90): These Microsoft Excel-based tools allow you to make your own custom media settings using automated formulas, create smoother bezier-shaped master curves than the standard QTR methods create, and includes an advanced single-step linearization functions with real time quad curve previews (including built-in error correction tools for use with only 51-step measurements that do not rely on the QTR-Linearize-Quad app). No matter which linearization system you use the increased density of the new ink is a welcome addition to the advance in fine art black and white inked printing, and Jon Cone and all the folks at Cone Editions Press and Inkjetmall are owed a warm sense of gratitude for their continued commitment to pushing the state of the art. If you get my email newsletter you might remember that I spent some time out West this winter. Most of the trip was spent in and around Los Angeles for PhotoLA and doing press checks on the last 4 books in the Portfolios of Brett Weston Series. But in there I made some much-needed time to photograph in the Eastern Sierra and Death Valley. This is one of the photographs I made with the Leica Monochrome on the last day of the trip before heading to the airport to teach a one-on-one workshop in the Midwest. The last morning in the Owens Valley was the one of the best I've experienced in the nearly 20 years I have been traveling to the Eastern Sierra to photograph, and I stayed to photograph much longer than I should have which made for a stressful drive back to LAX to catch my flight out. I think it was worth it. This is one of the first photographs I printed with the new Ultra HD Matte Black ink and I think it really shows how the rich deep black enhances the feeling of the subtle midtone contrast while also allowing you to see deeper into the shadow around the edges of the arch. The smoothness of the K5 gray inks are crucial in separating the delicate clouds, and the added warmth of the toning inks gives a greater sense of depth than the Warn Neutral inks do on their own. I am offering this photograph as a discounted example print until the end of April. Each one is printed on Hahnemühle Museum Etching (350gsm) and are offered in two sizes: 7x10 inches for $50 (discounted from $250) and 12x17 inches for $200 (discounted from $750). Mounting and framing is also offered for an additional charge.